Here's dinner in a bowl. 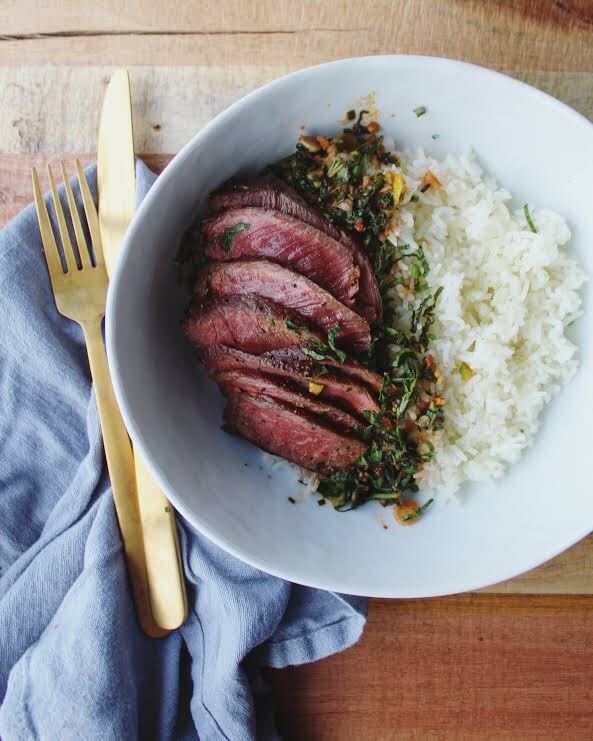 This is so simple to make, the sauce takes minutes to put together- and if you cook your meat and rice well- this will be a five star dinner in thirty minutes. 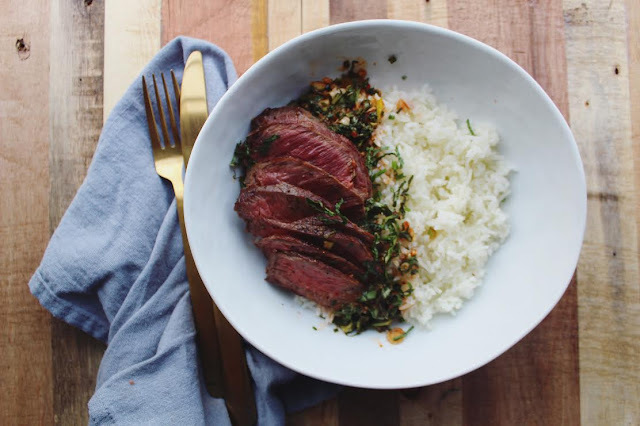 I love tossing the sauce into the rice and getting forkfuls of mint, chili, and steak all mixed together; taps into all the right flavor senses. 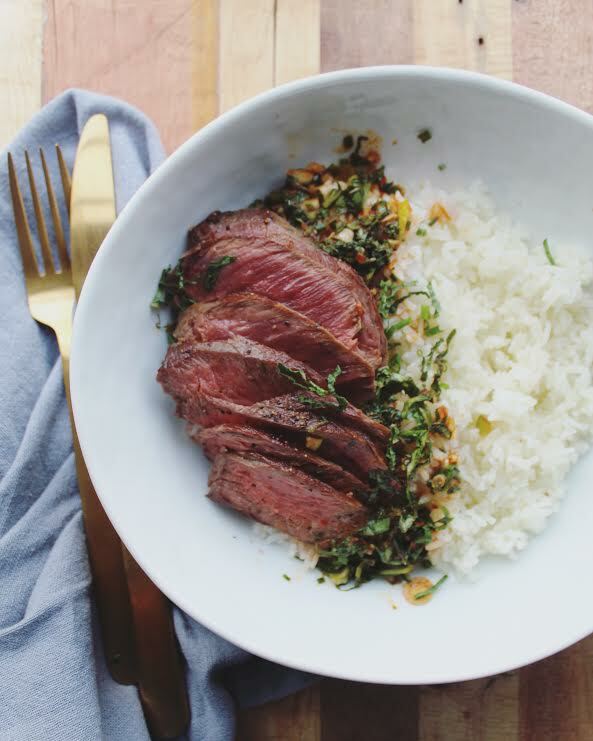 I recommend cutting the steak as thinly as possible and serving it more on the rare side. I really miss my favorite restaurant- Beverly Hills Thai in LA. This dish made me miss it even more but I was happy recreate some of my favorite flavors from there. 1. cook rice according to bag instructions. keep covered with a tight fitted lid in pot until ready to plate. Pat oyster steaks dry. preheat oven to 350°. generously sprinkle kosher salt and pepper on both sides. In an oven proof pan heat the olive oil over a high flame. Once oil is hot place oyster steaks in pan. allow the oyster steaks 2 minutes per side to crust in pan. place oyster steaks in oven for 8 minutes. remove steaks from oven and let them rest for 10 minutes before slicing. with a very sharp knife, slice steaks very thinly. for the sauce: combine mint, basil, scallions, chives, garlic, juice of both limes, zest in a bowl. mix in sesame oil, chili paste, soy sauce, and vinegar. Portion rice into bowls, top with some sauce, and place thinly sliced steak on top.